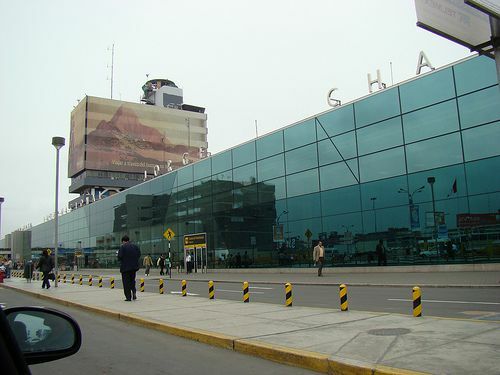 Jorge Chávez International Airport is located in the port area of Callao, part of the wider Lima Metropolitan Area. It is approximately 7 miles from the historic center of Lima and about 11 miles from the popular coastal district of Miraflores. The airport was inaugurated in 1960 and named in honor of Jorge Chávez, one of Peru's aviation heroes. The airport serves as a hub for all of Peru’s main domestic airlines: LAN, StarPerú, TACA, Peruvian Airlines and LC Busre. International airlines serving Jorge Chávez International Airport include Aerolíneas Argentinas, Air Canada, Air France, Alitalia, American Airlines, Delta Airlines and Iberia. For a full list, see the airline information page at the official Lima airport website. Years ago, all passengers passing through Jorge Chávez International Airport had to pay an airport fee (Unified Rate for Airport Use, or TUUA). This fee is now included in the ticket price, so passengers no longer have to stand in line to pay an additional fee at the airport. Lima airport has a good selection of restaurants, fast food counters and cafes. Peru Plaza, located on the second floor of the airport, is home to large international chains such as McDonald’s, Dunkin’ Donuts, Papa John’s Pizza and Subway. You’ll also find Peruvian establishments such as Pardo’s Chicken and Manos Morenas. More cafes and restaurants are located in the international departures area, including the Manacaru Cafe Restaurant, the Huashca cafe and snack bar and the La Bonbonnierre Restaurant. Shopping areas are located within the international and domestic departure areas and around Peru Plaza. You’ll find stores specializing in travel accessories, jewelry, clothing and books; there is also a pharmacy on Peru Plaza. For a last-minute bottle of Peruvian pisco, head to El Rincon del Pisco in the international departures area. General tourist information is available at a number of IPERU counters located in the international and domestic departure areas and at the terminal and boarding areas. To exchange money, look for an Interbank Money Exchange counter (international arrivals, domestic arrivals or Peru Plaza). Global Net ATM machines are located throughout the airport. To rent a cell phone or top up on credit, stop off at a Claro or Movistar counter. The Movistar area on the north Mezzanine has telephone booths and internet access. You’ll find a Serpost post office on the central mezzanine. To rent a car at Lima airport, look for Budget, Avis and Hertz car rental offices in international and domestic arrivals. Other services located within the airport include luggage storage, train ticket offices (Peru Rail and Inca Rail) and a massage center in the international departures area. The four-star Ramada Costa del Sol Lima Airport Hotel is the only hotel located within the boundaries of Jorge Chávez International Airport. Hotel features include an indoor swimming pool, fitness center, bar, spa and free Wi-Fi internet access. The building is soundproofed to keep out the noise from the surrounding airport. The area surrounding Jorge Chávez International Airport is short on attractions -- it’s also not particularly safe. Most tourists head directly to the historic center of Lima or to coastal districts such as Miraflores and Barranco. These cabs wait in line just outside the main arrivals building. You can flag down a cab outside the airport boundaries, but it’s not really worth the risk. Taxis in Peru -- especially in Lima -- are not always safe or reliable, so it’s worth spending a little extra for one of the officially registered cabs.